Western blot analysis of extracts from C2C12, H-4-II-E, and COS-7 cells using Phospho-Rpb1 CTD (Ser2) (E1Z3G) Rabbit mAb. Immunoprecipitation of Rpb1 from HeLa cell extracts using Rabbit (DA1E) mAb IgG XP® Isotype Control #3900 (lane 2) or Phospho-Rpb1 CTD (Ser2) (E1Z3G) Rabbit mAb (lane 3). Lane 1 is 10% input. 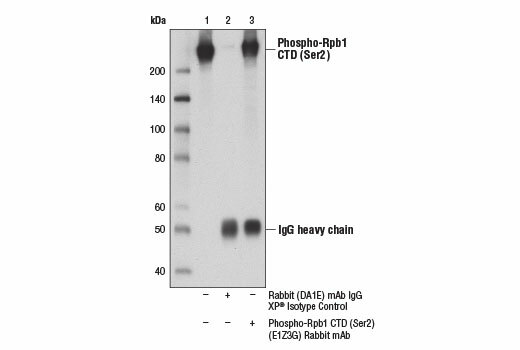 Western blot analysis was performed using Phospho-Rpb1 CTD (Ser2) (E1Z3G) Rabbit mAb. Chromatin immunoprecipitations were performed with cross-linked chromatin from Hela cells and either Phospho-Rpb1 CTD (Ser2) (E1Z3G) Rabbit mAb or Rpb1 NTD (D8L4Y) Rabbit mAb 314958, using SimpleChIP® Enzymatic Chromatin IP Kit (Magnetic Beads) #9003. DNA Libraries were prepared using SimpleChIP® ChIP-seq DNA Library Prep Kit for Illumina® #56795. 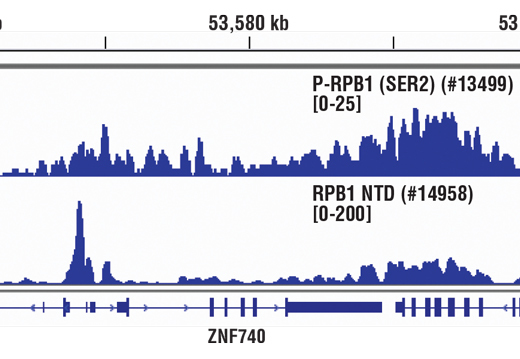 The figure shows binding across the ZNF740 gene on chromosome 12. For additional ChIP-seq tracks, please download the product data sheet. Chromatin immunoprecipitations were performed with cross-linked chromatin from HeLa cells and either Phospho-Rpb1 CTD (Ser2) (E1Z3G) Rabbit mAb or Normal Rabbit IgG #2729 using SimpleChIP® Enzymatic Chromatin IP Kit (Magnetic Beads) #9003. The enriched DNA was quantified by real-time PCR using SimpleChIP® Human β-Actin Promoter Primers #13653, human β-Actin intron 1 primers, SimpleChIP® Human β-Actin 3' UTR Primers #13669, and SimpleChIP® Human α Satellite Repeat Primers #4486. The amount of immunoprecipitated DNA in each sample is represented as signal relative to the total amount of input chromatin, which is equivalent to one. 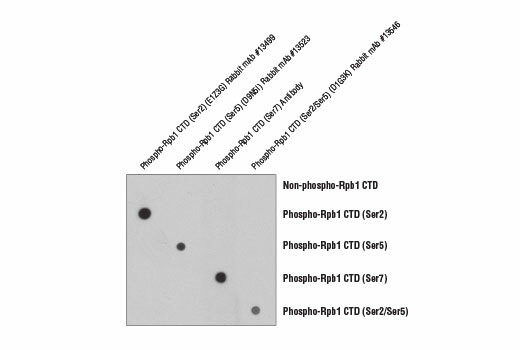 Peptide dot blot analysis demonstrating Phospho-Rpb1 CTD (Ser2) (E1Z3G) Rabbit mAb antibody specificity. Antibody binding to pre-coated Rpb1 CTD peptides is shown using Phospho-Rpb1 CTD (Ser2) (E1Z3G) Rabbit mAb, Phospho-Rpb1 CTD (Ser5) (D9N5I) Rabbit mAb #13523, a phospho-Rpb1 CTD (Ser7) antibody, and Phospho-Rpb1 CTD (Ser2/Ser5) (D1G3K) Rabbit mAb #13546. As expected, the Phospho-Rpb1 CTD (Ser2) (E1Z3G) Rabbit mAb only binds to phospho-Rpb1 CTD peptide when phosphorylated at Ser2. For optimal ChIP and ChIP-seq results, use 10 μl of antibody and 10 μg of chromatin (approximately 4 x 106 cells) per IP. This antibody has been validated using SimpleChIP® Enzymatic Chromatin IP Kits. 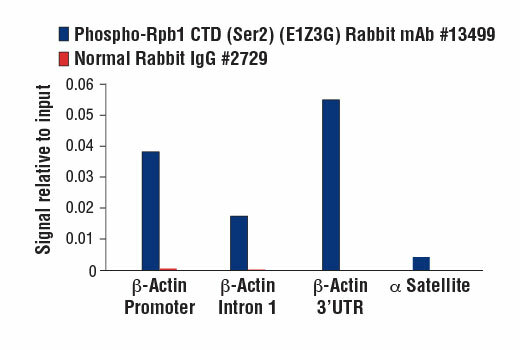 Phospho-Rpb1 CTD (Ser2) (E1Z3G) Rabbit mAb recognizes endogenous levels of Rpb1 only when the carboxy-terminal domain (CTD) heptapeptide repeat [Tyr1, Ser2, Pro3, Thr4, Ser5, Pro6, Ser7] is phosphorylated at Ser2. 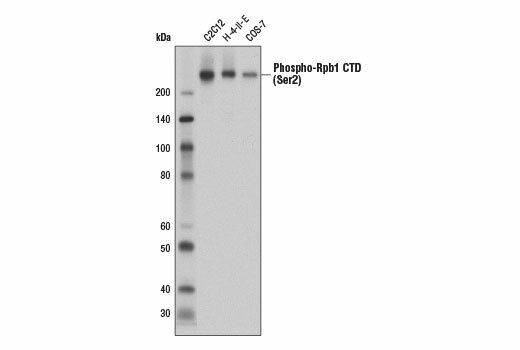 This antibody does not cross-react with Rpb1 CTD phosphorylated at Ser5 or Ser7. See how our ChIP-seq antibodies outperform the competition!